There are many reasons why customers love Gravity Water Filters. It’s a one-time investment that can give you a sufficient amount of water for a long period of time. Except for the timely filter replacements, you don’t have to worry about anything either. Berkey has been the default choice for most of the time, and Propur was in the ‘ignored’ list. Now, after reading a few reviews across the Internet, we think we have been overlooking what Propur water filters had offered. That is why we decided to review some of the popular Propur water filters out there. Not to get you an early judgment, but we were really impressed by the hands-on experience. So, we wanted to review the performance of the filters from Propur. We would also be covering some things you should be aware of the product, such as the differences between Propur and Berkey water filters. We will start with how Propur water filters work. Propur Water Filtration: How Does It Work? Note: For this review, we would be considering Propur Big, one of the most popular water filters from the company. So, specific details may vary. To answer the question, please note that Propur Big is a gravity water filter. It means the product would be functioning based on the power of gravity. If we take the case of Propur Big, there are two containers present in the device, arranged vertically. The top portion has a lid, opening which you can pour impure water. When it comes to the bottom part, you can find a spigot, which disperses water. To start the purification process, you have to pour the water on top and wait for some time. During this time, water would go through the in-built filters. In a few minutes or so, pure water would be available in the other part. The best part about Propur is that you don’t need plumbing technique here. As you can see, the water filtration system of Propur Big is as simple as it gets. You pour impure water on top, and you get pure water at the bottom. Awesome, huh? Construction: What Is Propur Big Made Of? You would be concerned about the construction of this Propur water filter since you are going to use it for getting drinking water. There are three main components you should know. In short, the construction of Propur Big is not only long-lasting but also anti-bacterial (the silver helps). Where Are Propur Big Water Filters Made? Filter element used in Propur Big comes from England. Some sources have quoted Propur saying that the filters are made using both domestic and imported components, and the filters are assembled in the US. What Contaminants Can Propur Big Remove? We understand this is the big question when you are choosing a gravity water filter. Don’t worry, Propur is really good in this aspect as well. We have to depend on the results from an independent lab to understand the effectiveness of Propur. It is found that the filter can remove the following contaminants from your feed water. Note: the data is based on the ProOne G2.0 Filter. It’s pretty amazing that the Propur Big can remove lead from the feed water. According to the lab data, it is so great that 100% lead was removed from the contaminated water. This is something reassuring for anyone who depends on communal water supply. In short, when you are using Propur water filters, you don’t have to worry about lead, fluorides or chlorine. It also gets rid of odors and bad tastes. You can check out the following links to know about how well Propur filters remove the contaminants. Does Propur Water Filter Remove Microplastics? Several studies in the recent past have noted the emergence of microplastics as the next big thing. This type of small plastic particles can cause a number of health issues, including high reach. Recent research noted that microplastics are now present inside human bodies, making the issues worse. Considering all these, it’s great that Propur water filters remove microplastics from feed water. According to lab data, Propur water filters can remove up to 99.99% of microplastics from the normal feed water. Now, that’s something to stop worrying about. 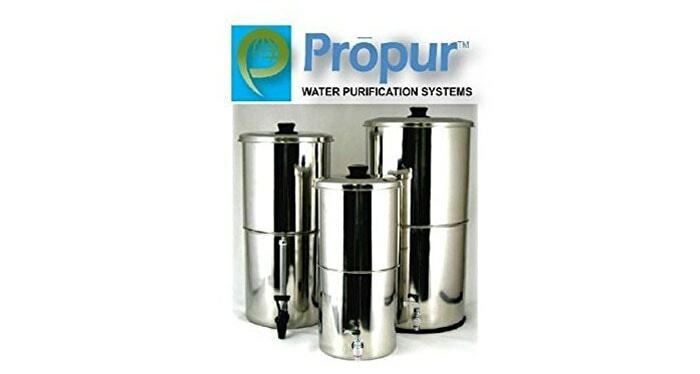 Are Propur Water Filters Certified by NSF? Most of the filter elements used by Propur are certified by NSF, National Sanitization Foundation. You can gather more information about the certification on the official webpage of NSF. NSF certification means that the Propur water filters remove contaminants at the best level. You can drink each cup of water with confidence. What Are the Dimensions and Capacity of Propur Big? Propur Big comes with a height of 21.5” and the diameter of the container is 9.25”. As it has a maximum capacity of 2.75 Gallons, a family of 2-4 people should be quite satisfied with the Propur Big on any day. 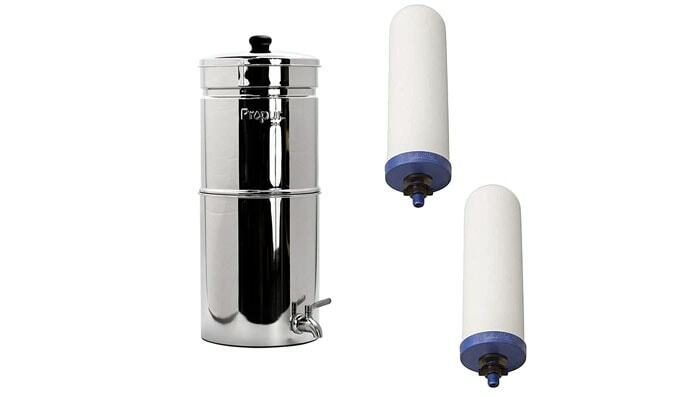 Which Are The Other Sizes of Propur Water Filters Available? As we said earlier, Propur manufactures a wide variety of water filters. These vary in terms of size, capacity and of course the budget. You can refer to the following table for more information about the variants. What’s Inside the Propur Big Package? In addition to the full-sized filters, Propur is also manufacturing pitcher-based filters. Because this pitcher is coming with a removable infusion tube, you can bring the flavor of fruits and vegetables to the water if you want. It means the package has everything you need for setting up the filter in a few seconds. And, once you pour feed water into the top chamber, the cleaning process would begin. Which Are the Accessories Available for Propur Big? As it happens, you can use a number of accessories to boost how you use the Propur Big Water Filter at your home or office. We have chosen a few that you may be interested in. This is a great accessory if you want to place the Propur water filter at an upper position. 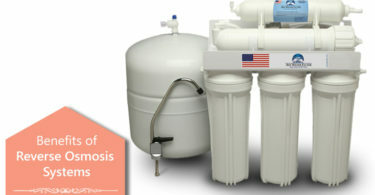 It has been designed to accommodate the proper design of the water filter. It can enhance the height by eight inches, making the task of dispensing water easier. This spigot would be replacing the default spigot that you can find on Propur water filters. With this spigot, however, you can understand the level of water inside the chamber without actually opening it. This would be a great addition. You can consider these products if you want to make use of your Propur Big in an easy way. How Long Does Propur Big Take For Filtering Water? If you have a Propur Big water filter with dual filters, it might take 6 to 7 hours for filtering 2.75 Gallons of water. However, you can always add an extra filter to enhance the process and boos the filtering time. While it’s true that a steady flow of water demands some planning, you can get things ready in a day or two. For instance, if you want a full chamber of water in the morning, make sure you fill it at night. How Often Should I Replace Propur Filters? Sustainability of the water filter depends on the type of water you have, the amount of pollution and indeed how much you are filtering. However, there are some standard precautions. Propur recommends that you should replace the filters once in 12 months. But, as we said, always keep an eye on whether it’s wearing out. Costs: What’s the Cost-per-Gallon Rates for Propur Water Filtering? According to an unofficial spokesperson of Propur, one ProOne G2.0 Filter from Propur can filter somewhere around 700 and 1200 Gallons of water. This, as we said, depends on the various aspects in play. As per the market price, you have to pay around $139 for getting a pair of ProOne G2.0 filters. This pair will be able to filter somewhere between 1400 and 2800 Gallons, right? So, depending on the type of water you have, Propur Big would cost you 5¢ to 9¢ per Gallon. Now, let’s compare Propur water filters with some others. Berkey, as we said, has been another big player in the water filter business. Let’s look at the differences. You don’t have to include additional fluoride filters in Propur water filters. The ProOne G2.0 is quite a lot effective when it comes to removing fluoride from water. This isn’t the case with Berkey. Unlike Berkey, you don’t have to prime the filters in Propur systems. You will be able to place those two filters in place and start getting pure water. You can fill any amount of water at the top and get maximum flow rate with Propur devices. This is not the case when you have a Berkey filter. While you can use Berkey filters for 3 to 5 years, that’s not the case with Propur filters. Filters used in Propur need to be discarded after a year. As you can see, these differences have to deal with convenience and preferences. So, you can make the right choice. It’s also worth noting that both companies do a great job in removing contaminants just that the removal of fluorides is optional in the case of Berkey. As it happens, there are some differences between the water filter systems from Propur and Alexapure also. Despite the similar external outlook, Alexapure water filter systems make use of a plastic spigot while you can find a stainless steel spigot in those from Propur. Both systems perform really well when it comes to the removal of contaminants. The only difference is the case of lead removal. While the filters of Propur Big manage to remove 100% lead from impure water, Alexapure filters are capped at 96.4%, which is not so bad. Still, if you want lead-free water, it makes a difference. In terms of price, Alexapure water filters are less expensive than the others. However, the company isn’t offering a warranty for the product, which is indeed a deal-breaker. If you come across any issues after the 45 days, you’re in trouble. It seems there are a few factors that may make you change the final decision. For instance, if your feed water is high in lead concentration, you can’t go for Alexapure. If you are planning to remove common elements from water, though, the products stand a chance. Where Can I Buy Propur Water Filters and How Much Do They Cost? While there are multiple places you can buy a Propur water filter, we recommend Amazon. When you buy from Amazon — from a trusted seller, for sure —, you can save some money for sure. You can save around $50 or $100 at times. However, if you want brick-and-mortar stores, that would not be a problem either. Another option is the official website of Propur USA, which is also offering free shipping with orders. 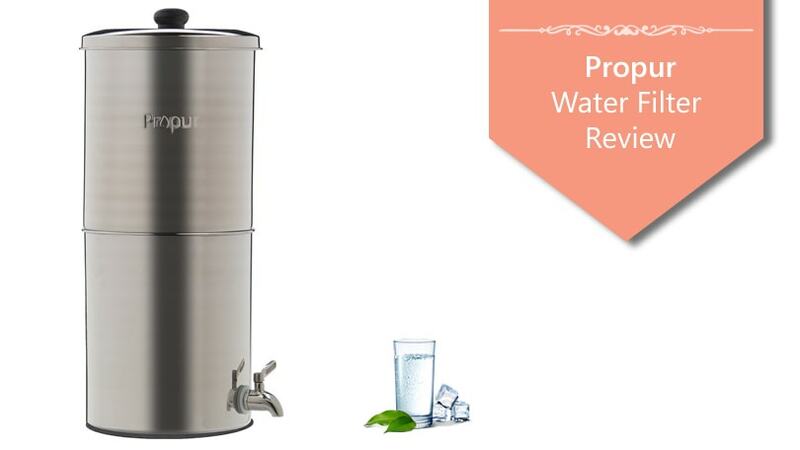 For instance, the price of the Propur Big water filter has been fixed at $279.00 on the official website at the time of writing. As far as the pricing goes, we cannot say anything certain about the prices on Amazon. As you know, Propur Water Filter prices also change according to demand and other aspects. So, you can check out the link to know the price by yourself. Does Propur Offer Warranty for Its Products? Yes, Propur offers a standard warranty for its products. In the case of filters, it offers a 1-year warranty. These should make you confident enough to get the products. Also, as we have noted earlier, the company has been in the industry for a long period. Let’s have a look at the most-noted Pros and Cons of Propur water filters. Does Propur Make a Shower Filter? Yes, you can purchase a shower filter from Propur if you are interested. It’s likely that you are interested in the filter because Propur filters are so great. Propur ProMax is the flagship shower filter from the company. It’s really great at removing contaminants from feed water. You will be able to have water that is clean from fluoride and chlorine. 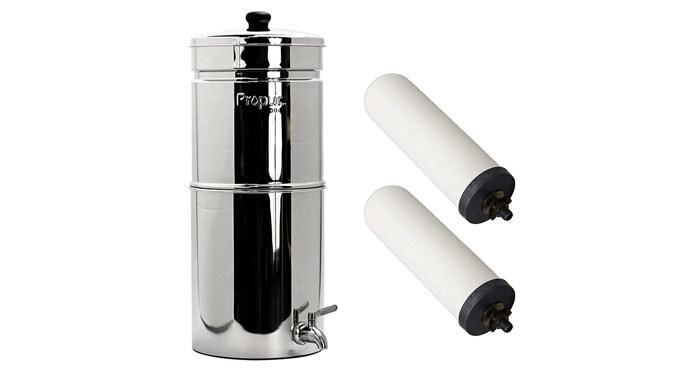 Considering what we have said earlier, Propur Big Water Filter is a great choice when you need an effective gravity water filter that fits on the countertop. In terms of performance, Propur Big is unparalleled and removes almost all contaminants from feed water. Due to the bigger size and capacity, it would be able to serve a family of 4 to 5 people. Even if you place it in an office, the experience would be hassle-free. We’d also recommend Propur Big if you need a filter that you can take on vacations or trips. Because its filter sets don’t need priming, you can use it almost everywhere.